I am interested in learning design patterns and would like to know what are considered top tier books in learning this subject. Is there a book out there that's the de-facto standard for describing best practices, design methodologies, and other helpful information on design patterns? What about that book makes it special? The original publication date of the book was October 21, 1994 with a 1995 copyright, and as of July 2010, the book was in its 38th printing. The book was first made available to the public at OOPSLA meeting held in Portland, Oregon, in October 1994. It has been highly influential to the field of software engineering and is regarded as an important source for object-oriented design theory and practice. More than 500,000 copies have been sold in English and in 13 other languages. Design patterns gained popularity in computer science after the book Design Patterns: Elements of Reusable Object-Oriented Software was published in 1994 by the so-called "Gang of Four" (Gamma et al.). Head First Design Patterns, by Eric T. Freeman, Elisabeth Robson, Bert Bates, and Kathy Sierra. Of those I've read Fowler's book, it's highly influential and a good read. At certain points it's a little vague for my taste, but overall it's an enjoyable book. There's an online catalog of the patterns included in the book, with minimal descriptions. Head First is a series of introductory instructional books to many topics, published by O'Reilly Media. It stresses an unorthodox, visually intensive, reader-involving combination of puzzles, jokes, nonstandard design and layout, and an engaging, conversational style to immerse the reader in a given topic. The term "design pattern" is somewhat vague, as every general reusable solution can be considered a design pattern. I've always noticed a tendency to apply the label on the solutions described in one of the notable books I've listed above, and more specifically the Gang of Four and Fowler books. Design patterns do not follow a unique development process, they are normal software solutions that happen to be immensely reusable and they are extremely hard to identify. But if you compare the online catalogs for both books with the contents of language specific books you'll notice that they are often used as templates. So I'd say that both books are very close to being canonical references, with the GoF book being the more important one from a historical perspective, even though both books are limited to object oriented programming. The Gang of Four book - Design Patterns: Elements of Reusable Object-Oriented Software is probably the closest thing we have to an industry standard on design patterns. For a more accessible introduction, Head First: Design Patterns is good too. Don't be put off by the 'trendy' cover, as it's a good read and will probably help you grasp the concepts in the GoF book a lot easier if you read it first. Yes, there is a well known book about design patterns: Design Patterns: Elements of Reusable Object-Oriented Software and the authors are often called "the Gang of Four" (GoF) and is referenced in almost all texts about design patterns. Design Patterns: Elements of Reusable Object-Oriented Software is a software engineering book describing recurring solutions to common problems in software design. The book's authors are Erich Gamma, Richard Helm, Ralph Johnson and John Vlissides with a foreword by Grady Booch. The authors are often referred to as the Gang of Four, GoF, or Go4. The book is divided into two parts, with the first two chapters exploring the capabilities and pitfalls of object-oriented programming, and the remaining chapters describing 23 classic software design patterns. The book includes examples in C++ and Smalltalk. One of the best design pattern websites around is Ward's Wiki, the very first wiki. See http://c2.com/cgi/wiki?HistoryOfPatterns for a good starting page in it. In 1987, Ward and Kent were consulting with Tektronix's Semiconductor Test Systems Group that was having troubles finishing a design. They decided to try out the pattern stuff they'd been studying. Like Alexander who said the occupiers of a building should design it, Ward and Kent let representatives of the users (a trainer and a field engineer) finish the design. Ward and Kent were amazed at the (admittedly spartan) elegance of the interface their users designed. They reported the results of this experiment at OOPSLA 87 in Orlando. They wrote up a panel position, and presented at Norm Kerth's workshop on Where do objects come from? They talked patterns until they were blue in the face, and got a lot of agreement, but without more concrete patterns nobody was signing up. Meanwhile, Erich Gamma was busy writing and reflecting about object-oriented design in ET++ as part of his PhD thesis. Erich had realized that recurring design structures or patterns were important. The question really was how do you capture and communicate them. Bruce Anderson gave a talk at TOOLS 90 at which ErichGamma was present; Erich liked the talk. Bruce gave a paper at EcoopOopsla90 (Ottawa) and ran a BOF called Toward an Architecture Handbook where he, Erich Gamma, Richard Helm, and others got into discussions about patterns. That was the first time that Richard and Erich met, and they realized they shared common ideas about the key ideas behind writing reusable OO software. You may also find the first three volumes of Pattern-Oriented Software Architecture to be a good read. Rules of thumb while arriving at pattern. This site also contains guide on Anti Patterns, UML and Refactoring. 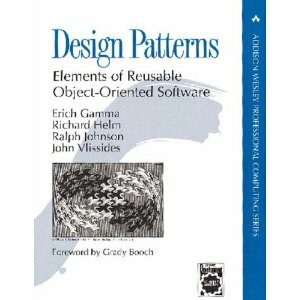 The original book, "Design Patterns: Elements of Reusable Object Oriented Software" is a good resource for object oriented design patterns. There exist many other books out there. When I need a quick reference and my GoF book is out of reach, Wikipedia normally has enough information on those and other design patterns. Those are the primary ones I use. It should also be noted that people have started applying the pattern format to other things, such as project management. If you want to know about antipatterns, which you should be aware of, there's two books, "AntiPatterns: Refactoring Software, Architectures, and Projects in Crisis" as well as "Refactoring: Improving the Design of Existing Code" which has a section on code smells, another name for antipatterns. "Agile Principles, Patterns, and Practices in C#" by Robert C. Martin. I think he has a Java version of the book as well. Also, not a pattern itself, but Domain Driven Design has some great concepts even if you don't go for the full DDD approach. If you are interested specifically in design patterns in C++ try Modern C++ Design by Andrei Alexandrescu. This book talks about how to implement commonly used patterns like Factory, Singleton, and Visitor in C++. It also talk about very C++-specific topics such as smart pointers, template metaprogramming, and policy-based class design. Not the answer you're looking for? Browse other questions tagged design-patterns books or ask your own question. Is the GoF book still the one to read? How to figure out real life examples of design patterns? Is there a canonical tutorial or book on functional programming concepts? Is there a canonical book on Agile? Is there a canonical book on Scala? Is there a canonical book on Ruby on Rails? Is there a canonical book on creating highly interactive websites (eg. “Flash” like) with HTML5/CSS3/JS/jQuery? Is there a canonical book on Monodroid? Is there a canonical book on x86 assembly? Is there a canonical book on functional design specifications? Is there a canonical book on Android Development? Is there a canonical book on requirements gathering?